Whether it’s going to the gym, reading one book a week or cutting back on Netflix, many of us set reasonable New Year’s goals and strive throughout the year to accomplish them. But for Cassandra Willard, it didn’t take long to realize that her go-getter personality would never let her accomplish one of her recent aspirations. “A few years ago, a friend of mine challenged me to set aside one day a month where I just relaxed and did nothing,” Cassandra says. “I rested for one day when I had surgery in January, but by the end of February, I knew this resolution was clearly not for me. I’m just wired to not be sedentary.” As a partner at the Florida-based Franklin & Willard law firm, head of the Entertainment, Art and Sports Law section of the Florida Bar and course director at Full Sail University, it’s easy to see why there’s little room for Cassandra, the NAWBO-Orlando chapter president elect, to spare a day for herself. For nearly as long as she’s been a business owner, Cassandra has also taught at Full Sail University. “I’ve always had a love for education since my parents were educators and this opportunity has been a perfect way for me to give back to the next generation,” says Cassandra, who works in the Entertainment Business Master’s program. Cassandra wasted little time making an impact on the NAWBO-Orlando chapter, immediately serving in a board director role before becoming the membership chair in August 2017. As co-chair, Cassandra was on the support team of the chapter’s inaugural Women Who Win mentorship program, a six-month program that pairs business women with students and new business owners. 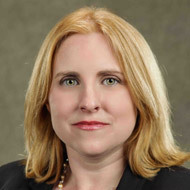 She has also chaired the chapter’s Advocacy Day workshop, which was sponsored by the Entertainment, Art & Sports law section of The Florida Bar, and volunteered to host four informational webinars for participants in the chapter’s first-ever PropelHER Pitch Competition, an event hosted at Full Sail University, in which women pitched their innovative business ideas for a chance to win more than $30,000 in cash and prizes. According to Cassandra, it’s easy for small business owners in particular to think they’re safe since they’re not the size of Facebook or Google. In fact, it’s usually the small- to-mid-sized businesses that hackers love to target most since many don’t have a full-time tech team on staff but they do have enough information available to make it worth stealing. Some of the many ways Cassandra keeps her own personal and professional data protected is by keeping the laptop that holds her business information disconnected from the internet in order to avoid hackers stealing her valuable information. She also backs up her computer on a physical hard drive at least once a week so that she’s in a position where she can access any data from a local, protected resource.